Turkey avocado wraps contain protein, carbohydrates and fats -- the three major nutrients your body needs. They are moderately low in calories and can be a healthy lunch option if you choose your ingredients wisely. A plain turkey wrap made with 3 oz. of turkey, an 8 inch white flour tortilla and ½ cup sliced avocados contains aproximately 470 calories. According to the USDA National Nutrient Database, the turkey accounts for 75 calories and the avocado 235 calories. Fatsecret.com notes that an 8 inch tortilla contains 159 calories. Common vegetables used for wraps include tomatoes, romaine lettuce, spinach, cucumbers, olives, onions and pickles. These veggies add no more than 20 calories per wrap, but provide vitamins, minerals and fiber. Each 1 oz. 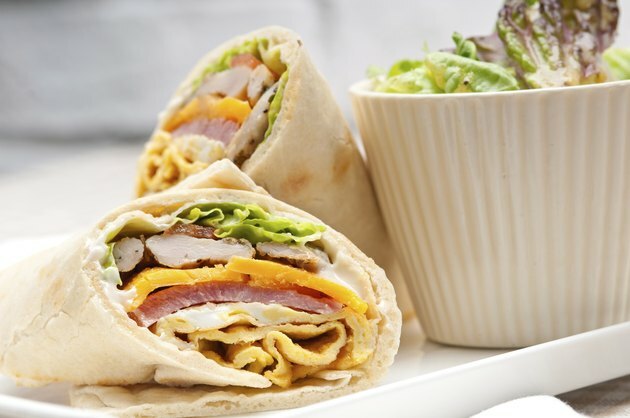 slice of cheddar, monterey jack or provolone cheese will add 100 to 120 calories to your wrap. Mayonnaise and mayo-based sauces and dressings add around 100 calories per tbsp., vinegar and oil contains 70 calories per tbsp. -- and 1 tbsp. of plain yellow mustard adds 11 calories. Avocados may be high in calories, but they are also high in B vitamins, vitamin A, potassium and heart-healthy fats. To reduce calories, use a 6 inch tortilla and only 2 oz. of turkey.